Last winter we went on a Southern Caribbean cruise that stopped at 6 different islands, including the island nation of Saint Lucia. One of the things we like most about cruising is that it gives us the ability to see a lot of places in a short period of time. Of course, the downside to this style of travel is that you only get a little taste of each island. Because of this, you need to be selective with the activities you choose to do on your day trip. Today, we’re sharing our brief, but jam packed, experience on the lush island of St Lucia, located in the eastern Caribbean between Martinique and Saint Vincent and the Grenadines. From hiking through rainforests to snorkeling and sailing, you’ve got plenty of options that fit all travel styles and preferences. Get your St Lucia travel guide here. If you google Things to do in St Lucia you’ll find hundreds of tour packages and custom itineraries that include everything from booze cruises to helicopter tours to scuba diving. You can even check out the world’s only drive-in volcano! 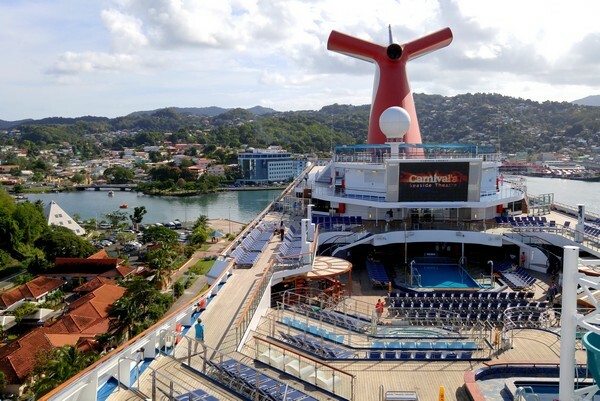 Going on a Caribbean Cruise? Get your travel guide here. Given that we had limited time on St Lucia, we decided to hire a private driver to take us to a few of its attractions. 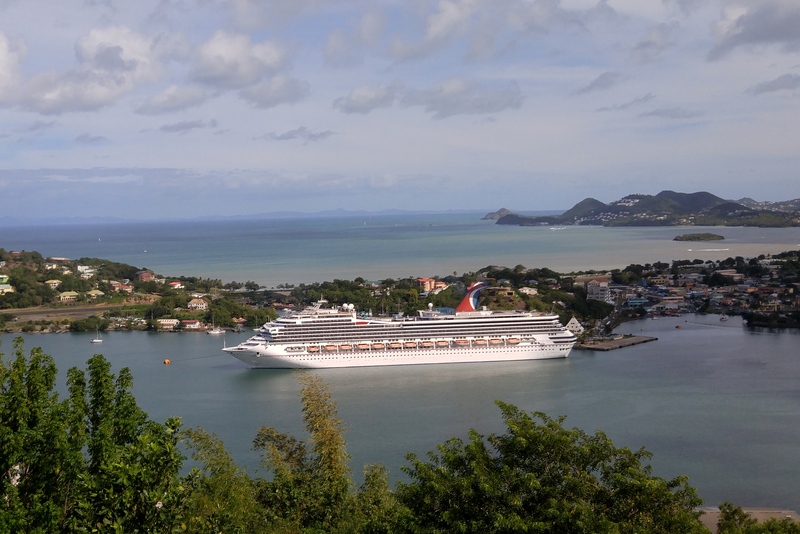 We chose a 2 hour tour that departed from the cruise ship port in Castries, the capital and largest city on St Lucia, and looped down to Marigot Bay and back again. 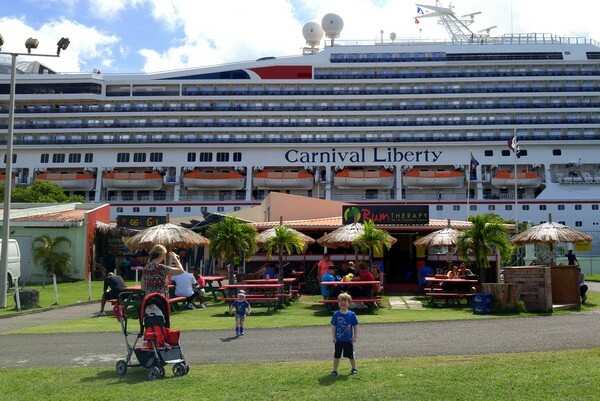 Prior to boarding the cruise ship in Old San Juan, Puerto Rico, we did a little research on each of the islands that was on the itinerary. After researching things to do in St Lucia, it became clear that the island’s star attraction is the Pitons, two lush volcanic spires that rise a half-mile above the coastline. The Pitons are located near the town of Soufriere, on the southwest coast, and are listed as a UNESCO World Heritage Site. While we would have loved to hike to the peak of Gros Piton, we were traveling with two young children and their grandparents, which meant finding compromise. 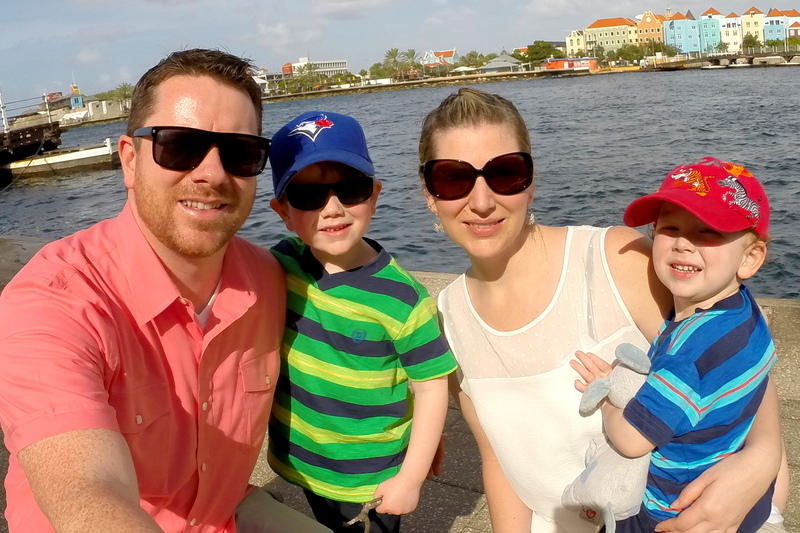 At the time of the cruise, Connor was still taking afternoon naps, so we only had about 4 hours to explore before it was time to return to the ship. 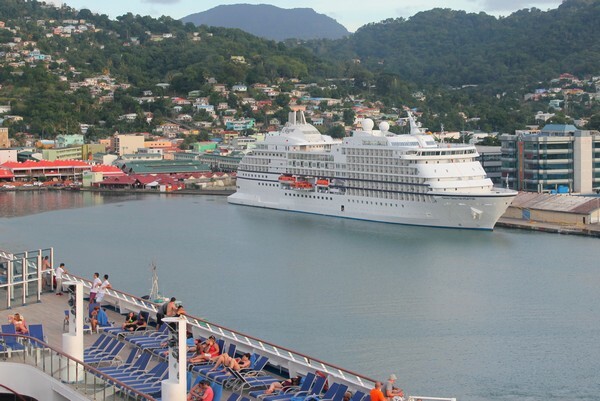 The cruise ship docked at the port in Castries. How great is this parking spot?! You can book island excursions directly on the cruise ship, but it will likely be more expensive than booking an excursion on land. If you plan to take a long excursion, like a loop around the island or a catamaran tour to the Pitons, you might want to book the excursion from the ship to ensure that your tour returns on time. It will likely cost a little more but you’re paying for peace of mind. The best way to screw up your vacation is to miss the ship, like this women. Don’t be late, the boat will NOT wait! We disembarked the cruise ship at around 9:00 AM and walked to the tourist info center. Dozens of hungry tour agents shouted their packages and transportation options at the tourists that passed through the info center. It was a little chaotic and reminded us of our time in third world countries, where sun-burnt tourists are viewed as nothing more than a dollar bill. Once we began talking with a tour agent the vultures magically disappeared. I suppose it’s the unspoken code of the tour operators – once they have a hook in the mouth of a tourist, the others move along to new opportunities. I can’t remember the name of the tour we took, but it appeared to be the most popular sightseeing tour on the menu. Because there was six of us, we were able to secure a private vehicle for the short sightseeing trip. If I remember correctly, I believe it cost $30 per person for this 2-hour tour. The first stop on the tour is to the lookout at Morne Fortuné, a hill and residential area located south of Castries (pictured above). The views of Castries Harbour are great, but it’s a bit of a tourist trap with far too many energetic merchants pushing their handmade souvenirs and bottled water on disinterested tourists. After we snapped a few photos we hopped back in the van and toured around the Morne Fortuné area. Our driver, Pat, informed us that the name Morne Fortuné means “Hill of Good luck”. He explained that this name could not be further from the truth, because the hill was a constant battleground between the French and the English. The island has changed hands 14 times between the French and English! We drove around Fort Charlotte and Pat pointed out a few of the historical sites, including the old Powder Magazine & Guard Cells, the Morne Battery and the French & British Cemeteries. We passed through an old military barracks that have since been converted into a school. Class was in session that day, so we caught a glimpse of school life on a Caribbean island. It’s fascinating to think that those classrooms once served as a military facility. The next stop on the tour was to a wood working artist studio. While the art was nice, the prices were not. It felt like another tourist trap. We did our quick stop and moved on. I get the feeling each of the tour operators get a commission for bringing tourists to the store. 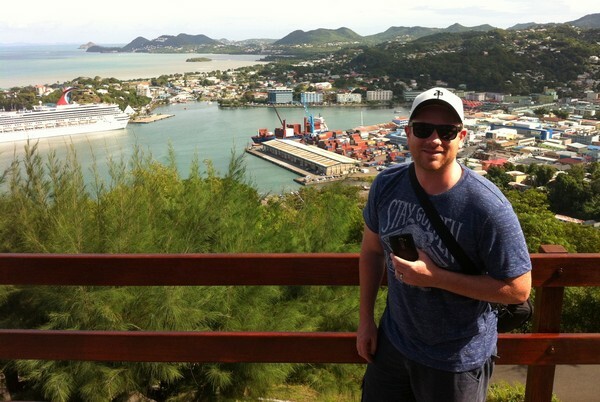 Our tour continued to a viewpoint overlooking Marigot Bay (pictured above). 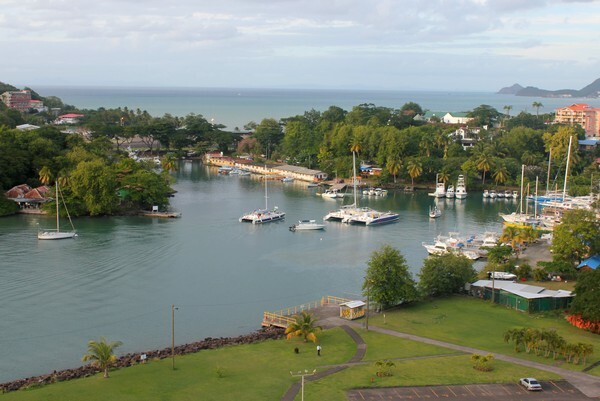 Aside from it being labeled as the most beautiful cove in the Caribbean, Marigot Bay is also a historic landmark, having been the site of a number of battles between the French and British navies. We didn’t actually go down to the beach or marina because we were limited on time, but the lush landscapes from the viewpoint are worth a visit. Get your St Lucia travel guide here. 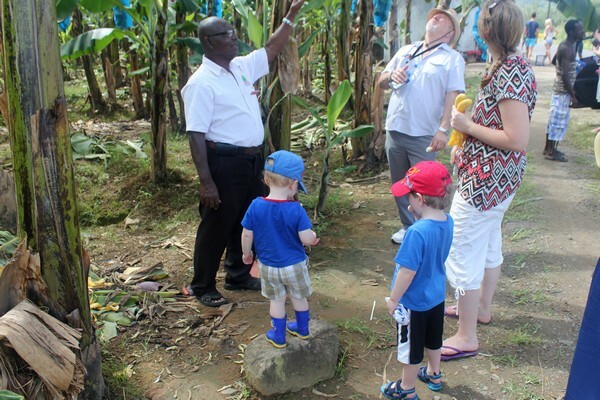 The next stop on the tour was to a banana plantation. This stop was not at an actual facility, but rather a roadside section of the active plantation. 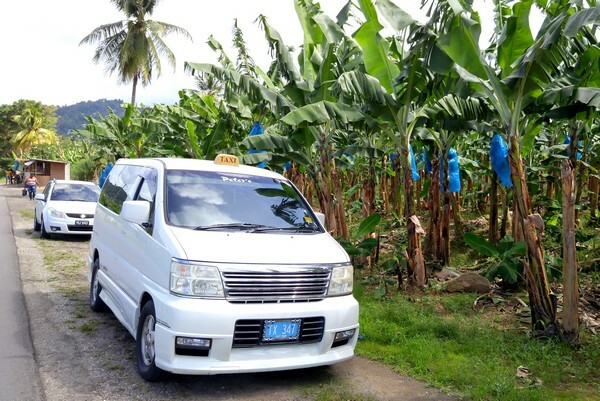 Our driver, Pat, shared his banana knowledge and let us wander up and down the rows of banana trees. I’m not much of a banana history buff, but it was interesting to learn about the economic impact of banana production on the island. 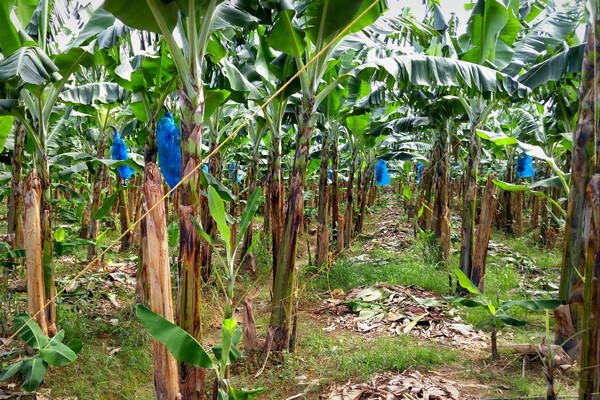 Next to tourism, banana production is the second largest revenue generator. Pat let us sample a few ripe bananas and gave us a bag of dried banana chips to chew on. The rumors are true – bananas taste MUCH better in the Caribbean! 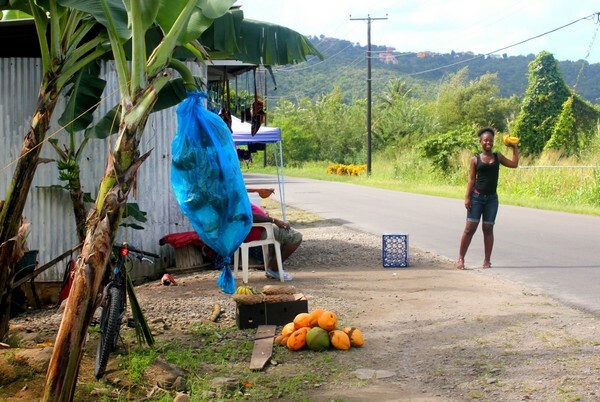 After the brief stop at the banana plantation, we made our way back to bustling streets of Castries City. We drove though residential neighborhoods and caught a glimpse of every day life on the laid-back island. 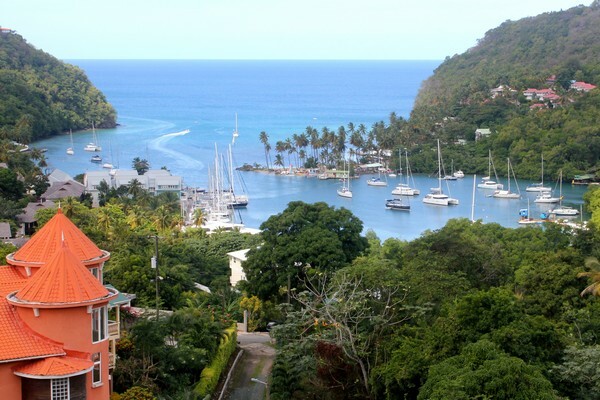 Like most tropical islands in the Caribbean, life moves a little slower on St Lucia. There are lots of shops and outdoor restaurants/bars located inside the cruise ship terminal (see above photo for proximity of cruise ship to outdoor bar). In fact, if you’re not really interested in exploring the island, you can get off the cruise ship and hang out at the terminal. It’s set up like an outdoor mall, so you can wander around at your own pace. Beers are only $2 on land (or 3 for $5), which is a much better deal than on the cruise ship, where beers are $6 each. 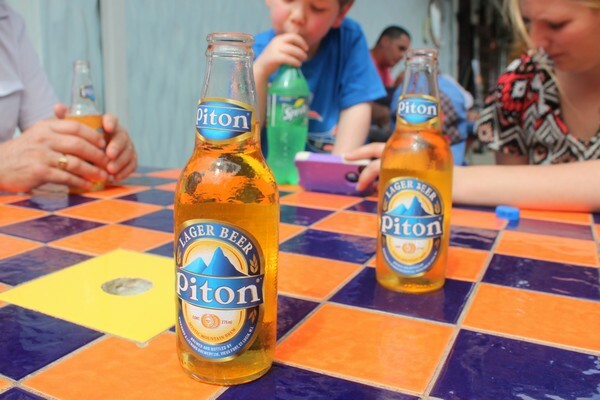 We enjoyed a few frosty Piton Lagers while the boys ran around on the grass park. The photo below was captured from the ship deck and you can see the grass patch along the waterfront. Now, if you look at the above photo, I captured that photo of Braydon and the ship from that grass to the left of the parking lot. Perspective. See the Pitons. We are told that the best way to see the Pitons is from the water. You can book a variety of catamaran or sailboat excursions that pick you up from the cruise ship terminal. You can also see the Pitons from the town of Soufrière, the original capital city of St Lucia. The colorful town of Soufrière is wrapped around a beautiful bay and is best seen from an overlook on the main road to Vieux Fort. Originally founded by the French, Soufrière is said to be one of the prettiest areas on the entire island. Sulphur Springs and Drive-in Volcano. While in the Soufrière area, make some time to visit the World’s only drive in Volcano. You can also take a mud bath with the volcanic mud. They may not smell very nice, but the mud baths at Sulphur Springs attract people from all over the world because it detoxifies the body and helps heal sun burns, eczema, arthritis and sore joints. Pigeon Island National Park. Located at the very northwest tip of St. Lucia, Pigeon Island National Landmark is a 44-acre islet connected to the mainland by a causeway. The island features an 18th-century British naval garrison, a small museum and two small beaches. Visit the lookout point at Morne Fortuné. If you’re looking for a quick excursion, the Morne Fortuné lookout point that I mentioned earlier is a great place to get a better view of the island. Most taxis at the cruise ship terminal will take you up the hill and bring you back after a few photos. Rainforest Aerial tram. You can explore the island’s rainforest on a guided nature tour aboard an eight-seat, open-air aerial tram that offers a bird’s eye view of the lush tropical forest. More info here. Marigot Bay. If you have the time, a great way to spend an afternoon is on the crescent shaped beaches at Marigot Bay, arguably the most beautiful bay on St Lucia. If time is not on your site, you can do what we did and take a few photos from the view point. Get in the water. You’re in the Caribbean, so get in that clear, turquoise water and start exploring! There are dozens of scuba and snorkeling trips for all skill levels and schedules. Pirate Ship Adventure. Another family fun adventure is to sail along the Caribbean island aboard the Black Magic, a Replica 16th Century Galleon. The pirate ship sets sail from the Rodney Bay Marina and makes its way down to Soufriere. In Soufriere, guests can visit The Pitons, drive-in volcano, Toraille Waterfall and Morne Coubaril Estate. Wander the vibrant streets of Castries. 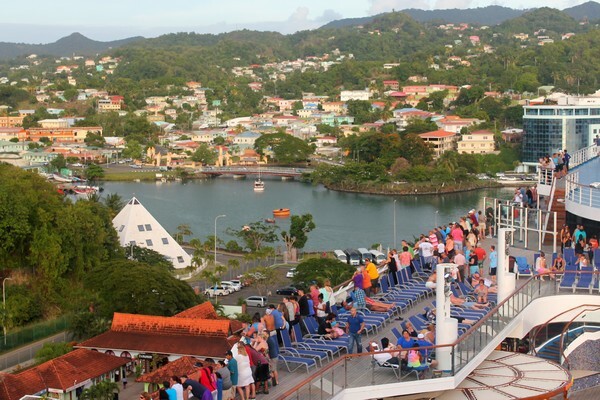 The cruise ship terminal is close to the downtown area so you can walk to the popular Castries Market and Craft Market. Vendors have gathered here for more than 100 years to sell fresh fruits and vegetables, handmade crafts and the usual touristy souvenirs. Get your St Lucia travel guides here. What did we miss? Do you have tips for things to do in St Lucia? Share your recommendations in the comments section below. Our readers thank you!